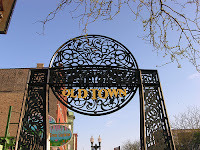 Old Town is indeed old and served as a trading area to many Native American tribes, whom were forced further west of Illinois following the Treaty of Chicago in 1833. The land was then settled by some of the millions of German who made the midwest their home in the 1860's. An American phonemena called 'white flight' then took over in the 1950's as families sold up and moved out of racially tense cities, such as Chicago and set up home in newly found suburbs. However Old Town had a bohemian feel to it, the artists had already been around for a while and it was the swinging 60's so Old Town became home to the hippy movement, particularly around Wells Street and North Avenue. Boutiques started to open selling clothes and household items including the first ever Crate & Barrel store (the privately owned chain of stores is estimated to now have sales of $1bn) and Old Town School of Folk Music opened too, which is still there, as the enclave became the centre of Chicago Folk Music. The Old Town Ale House also played it's part in the drug-fuddled Old Town of the 60's. Following the 1968 Democratic National Convention and the recent assassinations of both Martin Luther King and Robert F. Kennedy riots became common place in the Old Town area, which forced more people out. Racial tension followed in the 80's but Old Town held most of it's charm, for which people that live there or visit should be pleased about today. Old Town is most known in Chicago for it's Art fair. 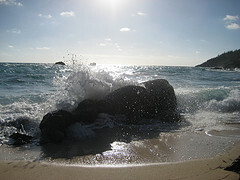 Normally held in June with over 200 stalls selling all kinds of art work, fairly priced too. I spent a bit of money there in my first year here. As well as the art, there is live music, a garden walk, plenty of food and stuff for kids to do. 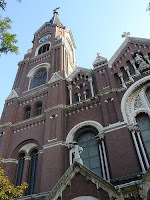 St Michael's church is one of the oldest buildings in Chicago dating back to the mid-1800's. Built by redemptorist Fathers for the German community, the church was severely damaged in the Great Chicago Fire but the walls and tower survived. It is also the tallest church in the city. Not many people know that. Old Town is also home to the oldest standing train station serving the CTA Elevated Railway (The L). The station at Sedgwick and North was built in 1900 and looks like it, although it is currently undergoing construction. Wells Street is the main thoroughfare and is where most of the action happens. I love Adobe Grill and it's superb guacamole prepared tableside. Across the street is French stalwart Bistrot Margot, rather usurped though by the new Old Town Brasserie. We ate there a few weeks back and the food was excellent. A great place to take visitors though is Twin Anchors. A Chicago institution since 1932, the barbequed baby back ribs are messy but gorgeous. The bar is fun to hang out in, and this was the first ever place I ate in in the city. The Old Town Triangle as it's also known has some unusual little shops, such as The Spice House, push the door open and smell a world of heady aromas. Pulp & Ink sells some great handmade cards, the beautiful House of Glunz has 5 generations of tradition in selling wines and spirits and the Old Town Aquarium is a one-stop-shop for anything aquatic from a fish in a bowl to a full blown commercial installation. As would be expected with the origins of Crate & Barrel there are plenty of 'housey' shops, Fleet Feet is a ru nner's dream, Haberdash is a fine mens clothes shop with good sales and Nicole Miller is a female equivalent. Old Town is also home to Second City, the comedy venue that launched the careers of John Belushi, Mike Myers, Bill Murray and the late Chris Farley. There are live acts every night on two stages and well worth a visit. Zanies Comedy Club is just a block away and makes Old Town the home of the Chicago comedy scene.